You, a loved one or your friend could be next, so please read this well informed book of these advanced 'Satellite Surveillance and Harassment Technologies', 'Direct Energy Weapons' & 'Information About Sophisticated RFID Microchips' that are being coerced subcutaneous implanted into human beings. The Author is a victim as well as I, although I'm the victim of these Bi-directional communication (Radio-Wave) types of Microchips. The Author has dedicated her time to the most well researched information on everything she has written into this book along with her 'True Story'! And to think while she wrote this book, please imagine being surveillanced with the Satellite technology, electronic attacks, and voice to skull 'V2K' a Synthetic or Artificial Telepathy! ~ Excerpt of review by B. K.
Excerpt from Book Description: With the availability of highly advanced technologies, after well over 50 years of research, testing, and development by the Department of Defense today, operating at all levels of government, law enforcement, the military and contractors, it appears that Big Brother's agenda has come of age by handheld, portable, land, sea and space based technologies and the weapon system first publicized during the Reagan era of the 80's as the Strategic Defense Initiative then fondly called "Star Wars." This technology is no joke and is here to stay. 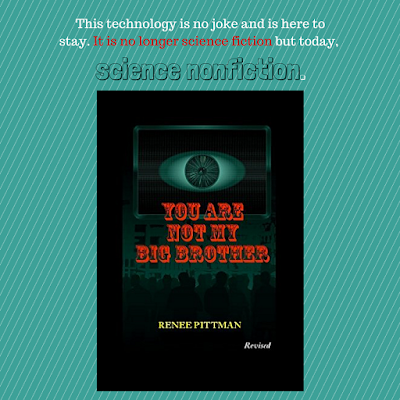 It is no longer science fiction but today, science nonfiction. This book is a wake-up call in awareness and a testimony to the strength, courage, and endurance of one woman and her fight for, justice for all against the odds, and unified efforts of many activist and whistle-blowers determine to expose the heinous, covert, immoral acts, by those privy to these advancements in the "Militarized Police State."